There are not too many artists, who were friends with Picasso, Brancusi and Simone de Beauvoir and who are still alive and able to tell us about it. Soshana is one of the few, who is in this position and that is not all – she is one of the most important and successful Austrian painters. Of course she is also a Jew, who finally celebrates her first exhibition in Israel at the age of 80. If the war had not happened, than everything would be different of course. It seems as if there was no better figure of speech than this one to describe the development of her life and her career; Soshana, the Austrian Jewish painter, who opened her first exhibition in Israel this week. She, the Vienna born Jewess, who travelled the entire world with her art, truly closes a circle now. Shortly before the exhibition was scheduled to be opened by Soshana (in 1973), the Yom Kipur War broke out. A couple of months later Soshana left the country and has never returned. Now, 35 years later, at the age of 80 years, her abstract impressionist oeuvres (this is how she defines her work) will finally be displayed in an Israeli exhibition hall in the Givatayim Museum. 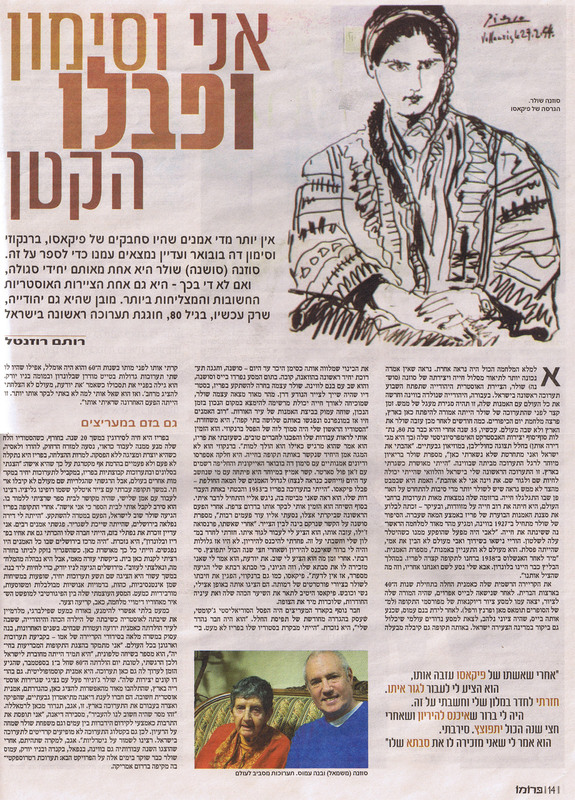 "I loved Israel and I regret that I did not stay here”, explains Soshana in a special interview in her home in Vienna. "I was happy when I lived there. It is my first exhibition in Israel (since then) and it would be nice, if I could live and reside there". Objectively speaking, it seems that Soshana does not have enough reasons to regret the development of her life. In her resume are hundreds of exhibitions in the entire world, for the most part of her life her suitcases were packed and she enjoyed the privilege to devour the flamboyant Paris art scene of the middle of the past century. Soshana's story starts in 1927 in Vienna and leads rapidly to the first war, which changed her life. "My father had a factory, which was confiscated, when Hitler came into power. The wedding of my parents was an arranged marriage, and my father was unable to understand my mother, who was a sculptress. He was never interested in art", explains the artist. "Right after the Anschluss in 1938 we escaped to Paris for a short time. During the "Blitz" we were alreay in London. My father went there and we followed him and that saved our lives". Her official carreer as an artist started in the early 1940ies in the USA. After she had married her art teacher Beys Afroyim, they went together on an expedition, where they portrayed outstanding personalities of that time (for instance the authors Thomas Mann and Franz Werfel). After the birth of her son Amos, Beys - who was a enthusiastic Zionist - convinced her to go on a world trip, which also included a visit to the young State of Israel. At that time her husband gave her her nom de plum, which accompanied her as her mark until today – "Soshana", and she had her first solo exhibition in Havanna, Cuba (1948). At the end of this journey Beys and Soshana got divorced and she returned with her son to Vienna. Soshana herself preferred to settle in Paris, in the studio of the famous painter Gaugin. Soon Soshana, who has proved throughout her life that she was always at the right time at the right place, found herself in the heart of the art scene of the city of lights. “Most artists lived in Montparnasse at that time and gathered in three cafés“, she told us. “My first studio was near Brancusi’s studio. He invited me to see his works and we became good friends. When I was leaving Paris he told me, that he felt as if he was dying.“ Brancusi is not the only great artist with whom she was in contact at that time. She drank coffee and enjoyed discussions with the unique Simone de Beauvoir and exchanged impressions with Jean Paul Sartre. She had a particulary strong contact to Pablo Picasso, who is still today (and probably always will be) considered to be the greatest artist of the past century. “I was at this exhibition (Picasso's) in Paris in 1953 and looked at one of his pictures. He noticed that I was looking at it, came over to me and started to talk with me. At the end of this conversation he invited me to visit him in Southern France. After I had visited him for the first time, I returned many times." Soshana tells about the relationship which developed between her and Picasso.“ After his wife Francoise Gilot had left him, he suggested that I would move in. I went back to my hotel room and thought about it. I was scared of getting pregnant. At that time there was no birth control pill and it was clear to me that I would get pregnant and that everything would be over after half a year. I rejected him. After some time he reaffirmed his offer. He told me that I reminded him of his grandmother and that sounded reasonable to me, since my great-grandmother came from Spain, so who knows?“ Picasso, like Brancusi, expressed his respect for Soshana by drawing portraits of her. She was depicted as a nobel, feminine and attractive woman. Picasso accented her dark hair and her flamboyant eyes, which immediately capture the viewer. Another friend from the art milieu was the surrealistic scultpor Giacometti, who contemplated on a new definition of space. “He was a wonderful and dear friend of me”, she said, “I visitied him quite frequently in his studio in Paris. I visited him before his death in the 1960ies and he was unhappy, even though he had two big exhibitions in the Tate Modern in London and in the MOMA in New York. He expressed his frustration by explaining, "You know, I have never managed to depict a room“. And then he asked me, why I had not visited him more often. That was the last time that I saw him“. Also (Naftali) Bezem (a famous Israeli painter) was one of her admirers. She lived in Paris for 20 years. During winter time, when her studio was so damp that she could not work, she travelled to the Far East, India and Asia and she constantly created and exhibited. Despite her success, she frequently encountered in Paris people frowning on the fact that she is a woman. "I exhibited in "Salons" and group exhibitions in Paris and had solo exhibitions in other parts of the world at the same time. But I sensed that the galleries there (in Paris) would never accept me. For some time I worked together with an Italian painter named Pinot Gallizio. We wanted to work together with a third painter, who was engaged at a school, at which I wanted to study. He refused to accept me as a pupil, because I am a woman.” After her time in Paris, Soshana came to Israel. This time she intended to stay there permanently. She remembered, "I had a wonderful apartment in Jerusalem, which belonged to an ambassador. I met many artists. I still remember Naftali Bezem, I was his friend and I also knew his brother from Paris and London. In Jerusalem, there was a centre, where all the artists gathered. I was so happy. When the ambassador needed his apartment again, I wanted to buy a house here. I asked my mother for help, but she was scared, because of the war and so I had to move away.” From Jerusalem she moved to New York. Ten years she exhibited there in solo exhibitions oil paintings with intense, dark brush strokes, with confused and torn, almost morbid figures. Her striking expedition between the figurative and the abstract left behind pictures of war, pain, disruption and suffering. It is almost unavoidable, almost like in a Spielberg movie, to depict her return to Austria as a dark Jewish girl, who returns to her hometown as a renowned and famous artist. In the past few years, the career of his mother has become almost a full time job for Soshana’s son – including arranging exhibitions all around the world. “I focus on the significant periods of her life”, he explains on the telephone. “She was always closely connected to Israel and that is why I had the feeling that at the occassion of her 80th birthday, which was on 1 September, it was time to have an exhibition here. She is a cosmopolitan artist. People in India also buy her paintings”. Amos Schueller worked together with representatives of the Austrian Embassy in Israel, who were thrilled to have the opportunity to exhibit oeuvres by an important Austrian artist. They established the contact to Anat Dyana from the Givatayim Theater, who worked as a curator and producer for this exhibition in Israel. The exhibition will move from here to Ramallah. "That was a very important message, we wanted to communicate ", explains Dyana. "I consider culture to be a contribution to promote the understanding between different peoples and Soshana is also delighted about this idea. That is why the exhibition in Israel is not mentioned in the exhibition catalogue. We want to preserve neutrality." By the way, just in case you have already expected it, after her works have already been exhibited this year in Vienna, Nepal, Canada and New York, Amos Schueller is busy these days planning the next project, namely a retrospective exhibition in South America.